In this workshop Alyson will teach you how to make a single rolled candle and a double twist candle from beeswax sheets. The children will be able to choose from a range of colours to make your candles. They will be given the opportunity to decorate the candles they have rolled to make them even more special and unique. Alyson set up Hives and Herbals in 2012. 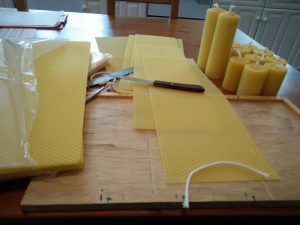 She is a Bristol Beekeeper and makes candles from beeswax she collects from her hives.